What was left by Apple as its budget handset, the iPhone 3GS, has been buoyed by its current contract price of free, and instead of going into the dustbin of history, 2 million units of it will be made for Q4, say supply chain probes. Analysts were content about the economics of keeping it in the lineup, although it doesn't really measure up to the newer generations, since it is a good entry level way to experience iOS for newcomers that won't break the bank for them. Apparently it has indeed turned out a desirable arrangement, if the supply chain sources hold true. 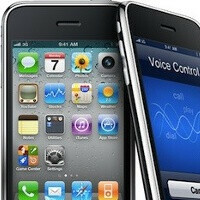 Not only is the two-year old iPhone 3GS expected to sell 2 million this quarter, but analysts claim the orders are for between 1.4-1.6 million in the first quarter of 2012 as well, so the golden oldie has evidently been breathed some new life into. It's so that the iphone does have a price in every price class. My brother's iPhone 3GS is not too bad with iOS 5... it still navigates crisp and clean, and although some functions will, no doubt, lag, I find it to still be a cleaner experience with the UI than can be found on any Android I could possibly afford at this point. The iPhone 4S is waaaay too expensive for me right now, and the iPhone 4 has the antenna-gate antenna which I would avoid like the plague. Of all the iPhones that are currently available, the iPhone 3GS is what I would consider starting out with. I do not care if it is an old design, behind the times, no camera flash, HVGA screen resolution, creeping processor speed and only HSPA 7.2... and at this point, I am willing to part with some of my old necessities like expandable memory... yeah, the iPhone 3GS may not be winning any fashion shows anymore, but I do not care. It would work well enough for my purposes in casual personal use, and in fact be capable of a LOT more than I need a phone for these days. On my parents AT&T 550 Nationwide family plan, it would still be a $9.99 add-on-line with $15.00 tacked on for 200MB of data, which I cannot imagine using all of anyway, and my folks would probably ask me to pay the extra $15 plus taxes that they would not already be covering... so I'll need some form of employment before I try to do this... but then my folks will start asking me to pay rent, groceries and other things, and I will need health insurance, so I better find a decent one when I finally do! I don't care about performance. I am sure the HTC Wildfire S is a decent phone, but I am tired of customizing everything and modding stuff. The Desire S, no doubt, can run computing circles around the 3GS. However, I am looking for something simple and smooth, which every Android I have ever met (aside from those occasional handsets that are running CyanogenMod or the XDA equivalent... but those mods void warranties more often than not) has not done consistently. Out of the box, without any changes or anything, the iPhone 3GS offers me a simple, cheap, smooth option. Granted, I will be locked into iTunes if I want to buy MP3's, and lose a lot of the freedoms I enjoyed in the past, but maybe for me the freedom is not that important any more. I understand it is very important for many of us, but I guess being helplessly poor, ill, dependent and unemployed for so long has taken its toll on me. I found your post quite contraditory. With android you have many more free apps. With Apple you'd spend a lot more in apps. For the same money (if what bloodline is true) you can have a better phone in specs (camera, processor, etc...) If you don't install any widget and keep only the icons, you will have the same iphone experience, yet keep Android's freedom. The only people I know that use the phone exactly as they come, out of the box (iPhones included) are my parents and grandparents. I don't get it. Customization is an option. You can leave it as it is. Like I said, I am thinking of greater consistency of behavior in the UI... I have never met a stock Android + whatever overlay that delivered the consistent behavior that the iPhone UI delivers (granted the iPhone has fewer functions, fewer choices, and so on...) for the things that it DOES do well. Also, I do not care a whole lot about specs... if it does what I want it to do reliably, then the specs are not important. I am not an avid photographer, and I do not plan on surfing the web a whole lot or doing actual productivity work aside from calendaring on a phone. I will talk on the phone, use the calendar and alarm, make an occasional note, get a few emails, perhaps play MP3's, and that's about it. Free is free, and I see no reason to try to step up to higher specs or nicer camera or faster processor when I do not need or care about those things, even though they may also be in the free-phone category. I do not plan on getting any apps or games, and I do not plan on buying anything from iTunes (aside from dumping my existing MP3 collection into an iTunes folder). I am getting up there in age, so I will soon be old enough to be a parent to some folks here... so it would not be outside of my new-found old-person mantra to do something like this. I am willing, at this point, to sacrifice the customization option for a little extra smoothness, intuitiveness, and stability in the UI. I mean, it isn't like I cannot choose my own preferred wallpaper image to put on the home screen background... and yes, I know so much more can be done than that, but I have no reason to bother with it any more. I am not trying to impress employers, coworkers, friends, family, or pretty ladies any more. actually the Wildfire is a cheap piece of crap, even by 2009 standards and should be avoided like the plague. It is exactly what is wrong with android phones. No internal memory, crappy UI optimization, and problems galore. Never buy android unless you are staying at the top of the line or at least buying a phone that was once considered top of the line (like an SGS1, Evo, Droid). It's a great phone, albeit a bit dated, and the actions of 2 million consumers clearly outweigh the noise of one addlepated and bitter individual. how do you get a phone cheaper then free? gemini... bloodline feels that the Wildfire S is a good phone, and for him, I am sure that it certainly has been. He made a suggestion of an alternate idea for me, and I appreciate his concern and ideas. As for the "moron" comment, well, I know that sounded bad to you, but I do not need to take that kind of stuff personally like you always seem to do. You, on the other hand, take his comment and try to apply your interpretation of it as a stereotype for all Android fans. You tell him he's rude and disrespectful, and call him stupid, when neither of your first two accusations apply to something that was not directed at you or meant to be truly malicious, and your third accusation is just plain wrong. Regular consumers think that if they purchase an iPhone 3GS it will get them up to date with the latest in mobile technology, they think "Even if its over 2 years old, its still an iPhone" I'm not calling these people stupid, they are just ignorant and haven't considered all their options for upgrading. Quite sad when you consider you could get a vastly better, newer, Gingerbread toting mid-range Android for the same price. I didn't even think the 3GS would even get iOS5. The people buying the iPhone 3GS must be the people who have free flip phones who are getting their first smart phones. (generally older people) The younger folks know about the iPhone 4S because they are in the know at school & the commercials on TV that target them. I think the iPhone 3GS is free or extremely cheap right now. It's sad but the iPhone 3GS is 100 times better than their old busted flip phones & they see all those nice cute Apple commercials & go for it because it's free or dirt cheap. There are 1GHz processor Android phones that run circles around the iPhone 3GS but the Apple stigma & word of mouth helps a lot. People who are informed know Android is the best, thus Android’s #1 OS ranking here in the U.S. & the world. I guess not all can be saved. I have the 3gs and it still feels alot smother than older android phones like my desire. The browsers were terrible on amdroid back in the day. The sgs2 is the first browser I have used that is honestly smoother than the iphone. Even the new nexus isnt as smooth as you think. Wow.... Could you even imagine if Motorola and Verizon started selling the original Droid again only for free so it's ok. Ha heck no. Shame how blind people can be.